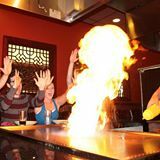 At Fujiyama, we provide excellent dining experiences with a great show. Come dine grill-side and have our expert chefs cook in front of you while providing a great show and fun for both families, couples, and large groups! Also, check out our fantastic bar with a great selection and excellent drink specials!